Named after the Torres family's private restaurant this white is made primarily from Parallada and Garnacha Blanca. Pale straw green with aromas of grapefruit pith and subtle herbs (fennel and sage). Light-bodied 11.5% ABV with refreshing crisp acidity and flavours of green apple, grapefruit, herb, and mineral notes. Perfect match for a delicate fish or sushi. 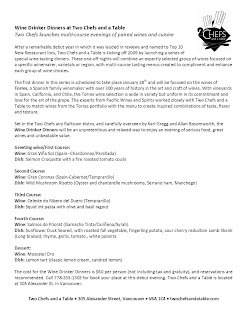 If you enjoy Torres Wines, Two Chefs and A Table http://www.twochefsandatable.com/, is organising a Torres wine dinner menu starting on January 28th. Here is the menu and wine pairing. Hopefully Helen and I will see some of you there. My goodness, this blog... its Alexandria library of happiness!